IBM has released IBM Notes Traveler version 9.0.1.3 with some really nice changes. Read the official documentation here. Support for the upcoming iOS app “IBM Verse”. Now the gap is closed and you can run your own “PIM container” delivered by IBM. The app isn’t available yet but will be soon. Support for synching the Trash folder on iOS. Finally. Using GCM (Google Cloud Messaging) for notifying Android devices about new mails. That’ll save A LOT of battery power on those devices. 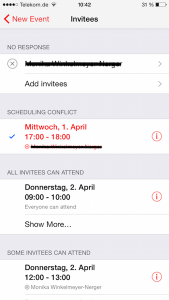 You can see the recipients meeting status now within the event on your mobile device. Freetime search on iOS! 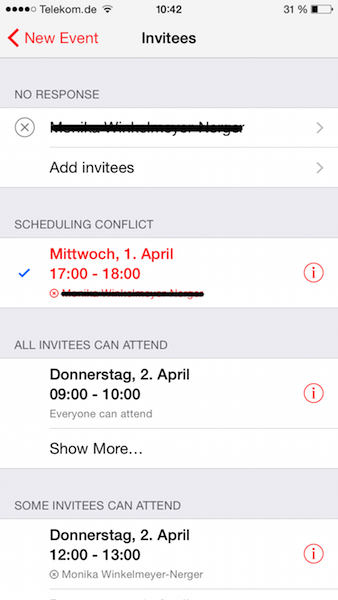 With iOS 8 Apple has introduced the capability to do a freetime search across the invitees calendars. With this new release you now have the capability to do that with Traveler. No longer worrying if an invitee isn’t available. Simply set the notes.ini parameter NTS_FREE_BUSY_SUPPORT=true on your Traveler server. Restart the Traveler task afterwards. See here how it looks like.